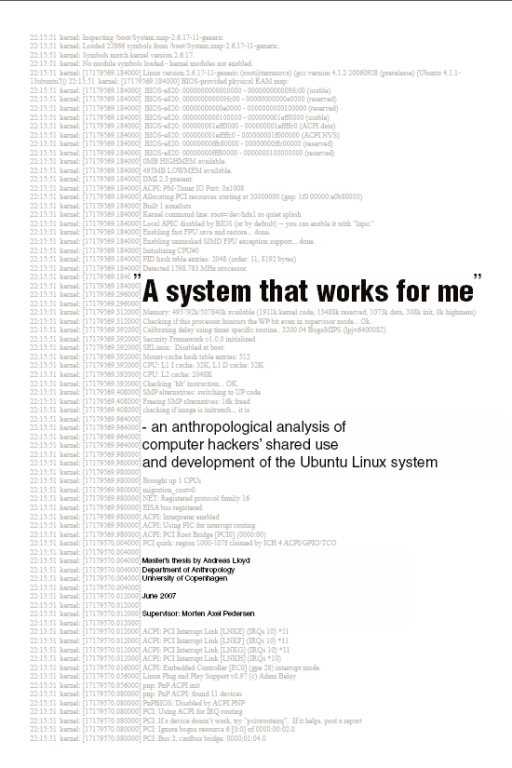 Based on more than 2 years of daily use of the Ubuntu Linux system and 6 months of on-line and in-person fieldwork among the developers working to develop and maintain it, this thesis examines the individual and collaborative day-to-day practices of these developers as they relate to the computer operating system that is the result of their labour. Despite being spread across the industrialized world, these Ubuntu hackers socialise, share their knowledge, and come to depend on each other in their work across the Internet, as well as in their in-person meetings at conferences and summits. I argue that these shared and negotiated on-line and in-person practices constitute a community of practice (Wenger) rooted in a more than 40-year old “oral” computing tradition based on the Unix operating system which has spawned a lively interdependent on-line eco-system of free software projects built on the reciprocal sharing of knowledge and source code which, guaranteed by cleverly crafted copyright licenses, has resulted in a cumulatively improved system developed openly on-line in a fashion which has made it a viable alternative to the mainstream IT industry. Congrats on getting so far with it, Anders!